This entry was posted in Free sample puzzles, Jigsaw Sudoku, Killer Sudoku, Sudoku Variants and tagged CONSECUTIVE, Daily Killer, Daily Sudoku, Daily Sudoku Variants, hyper sudoku, IQ, Jigsaw Sudoku, killer, killer sudoku, rules, Sudoku Variant, Sudoku Variants, variant, Weekend Special, windoku, ZERO, Zero Killer, Zero Killer Sudoku. Bookmark the permalink. Post a comment or leave a trackback: Trackback URL. Unless I am picking up the wrong text file, I believe this to be invalid. R89C1 is 3 which works out to be 12. R9C89 is 4 which is 13 making R9C1 2 and R8C1 1. R56C3 is 3 (1,2) disabling 1 in the rest of N4. The only place in R4 for 1 is R4C4 and making R9C9 3 and R9C8 1 (diagonal). Following this the only places for 1 and 2 in N1 are R12C2 with 2 in R2C2 (diagonal) and 1 in R1C2. This has the effect of making the combination for R1C67 (5) 2 and 3 and thus the combination for R3C56 (5)1 and 4. Looking at the opposite diagonal R1C9 to R9C1, the only place for 1 is in R3C7, which places that in direct opposition to R3C56. Unless, of course, I have picked up the wrong text file, or we are allowed duplicate numbers, or I am missing something somewhere else that I am unfamiliar with. 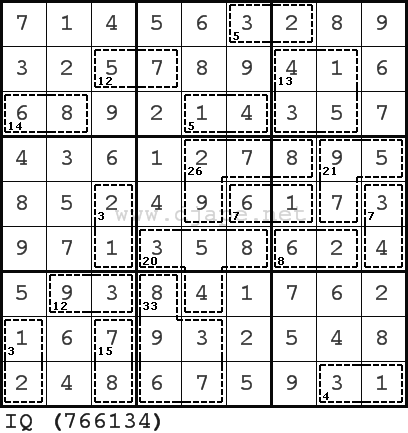 I also placed the text file in JSudoku which also finds an invalid grid. \”…and making R9C9 3 and R9C8 1 (diagonal)\”. Why do you think this puzzle is diagonal (X)? 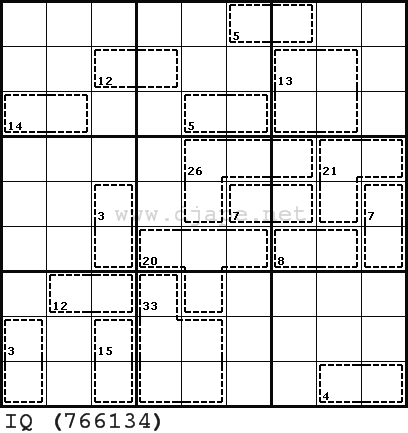 It\’s not indicated neither in the puzzle image nor in the text file. In the text file there is a code \”16\” (which I use for Zero Killers) in second position and if this was a diagonal, there would be \”d\”. Perhaps JSudoku is misinterpreting this \”16\”. If you open up the text file in PS v0.4 you won\’t see any diagonals. Let me know if you can solve it as non-diagonal puzzle! When in plugged into JSudoku it showed up as a diagonal. I will try it again later today, it didn’t actually look that hard, but looks can be deceiving. Flowed very smoothly without needing the diagonal. Only took a few minutes. Looking forward to next Sunday; hope they get more difficult. Great to see this sort of killer – enjoyed the break from designing killers! Looking forward to more. That was a great puzzle, thanks! Quite simple to solve, but a very nice concept. I look forward to next Sunday’s!